A false color, far-infrared image containing a galaxy (the red dot at the center) dating from about 900 million years after the big bang. Its red color is the result the cosmic expansion and its abundance of warm dust. 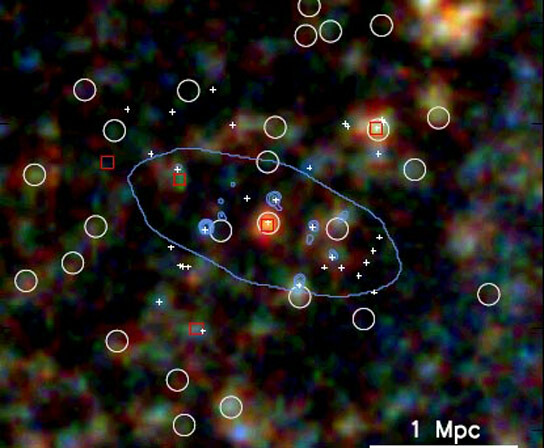 The other galaxies in the image (circled) are much closer; the scale corresponds to 2.9 million light-years (1 Mpc) at the distance of the galaxy. In a newly published study astronomers measured the emission from ionized carbon in seventeen young galaxies, revealing a good measure of the rate of star formation in the very early universe (except in sources deficient in carbon), that the UV fields are about 100-1000 times as strong as they are near the Sun, and that the density of the emitting medium is moderate. The first stars and galaxies began forming a few hundred million years after the big bang, and after a billion years their physical processes dominated the evolution of cosmic structure. More than a thousand candidates for these early galaxies have been spotted so far, despite their being distant and faint. A subset of them was discovered to be extremely bright at submillimeter wavelengths and making stars at fantastic rates, over a thousand per year, the result of their containing unusually large reservoirs of warm dust and gas. Early galaxies are the direct ancestors of today’s systems, and astronomers modeling their birth and evolution expect that they approximately resemble modern galaxies. There are some potential key differences, however, like the amount of warm dust; another is the relative lack of the chemical elements that are taken for granted today but which were made over the next twelve billion years of cooking in stellar furnaces. The team used an emission line from ionized carbon for their research. The line lies at an infrared wavelength that is masked by the atmosphere, but because of the high recession velocities of these distant galaxies, the spectrum is shifted to submillimeter wavelengths which are free of atmospheric effects. The particular carbon line chosen is produced when ultraviolet radiation from new stars ionizes neutral carbon atoms in the interstellar medium. Seventeen of the galaxies had this strong carbon line emission; carbon monoxide was also measured. The scientists report that the carbon line provides a good measure of the rate of star formation in the very early universe (except in sources deficient in carbon), that the UV fields are about 100-1000 times as strong as they are near the Sun, and that the density of the emitting medium is moderate, about ten thousand atoms per cubic centimeter. The team concludes that future observations will study individual regions within these early galaxies and measure other atomic lines to obtain better estimates of element deficiencies. Image: ESA/NASA/Herschel; Guilberg et al. Be the first to comment on "Astronomers Study the Interstellar Medium a Billion Years After the Big Bang"